Laila El-Haddad takes us into the intense life and world of a busy Palestinian journalist who is both covering the story of Gaza and living it, with her young son. El-Haddad was in Gaza City in 2005, watching hopefully as the Israelis prepared a troop withdrawal from the Gaza Strip. She covered the January 2006 Palestinian elections—judged ‘free and fair’ by international monitors. But then, she watched aghast as the Israeli government, backed by the Bush administration, moved in to punish Gaza’s 1.5 million people for the way they voted by throwing a tough siege around the Strip. 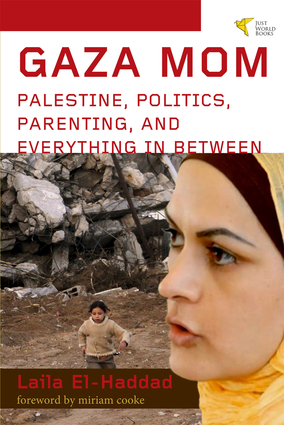 Gaza Mom>/i> provides a wealth of detail (and some charming photographs) that inform readers about the daily lives of Gaza's Palestinians, along with El-Haddad's reporting and political analysis. Laila El-Haddad is the co-editor of Gaza Unsilenced (2015), co-author of the award-winning ethnographic cookbook The Gaza Kitchen: A Palestinian Culinary Journey (2013), and the author of Gaza Mom: Palestine, Politics, Parenting, and Everything In Between (2010). She is a talented blogger, journalist, political analyst, social activist, and a policy advisor for Al-Shabaka, the Palestinian Policy Network.Born in Gaza, El-Haddad currently lives in Columbia, Maryland with her husband and their three children.